Why are A-Frames the perfect sign for inexpensive advertising? The basic principle behind any promotion is that do not assume that people know about your product or services, so inform them. Similarly, there is nothing better than putting up signs outside your company or organization. 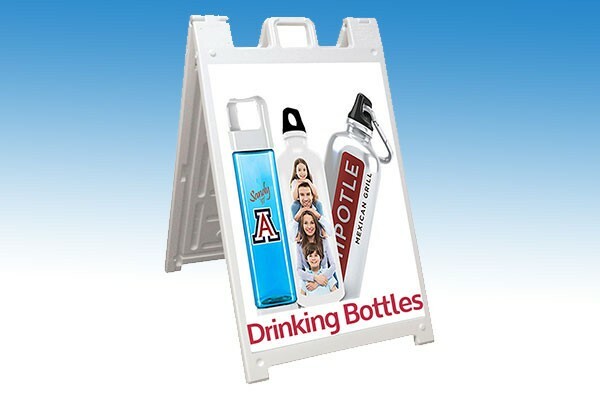 A Frames or Sidewalk signs are easy to display, change and transport making thus making them one of the popular choices of our customers. Just place it outside in an easy to see area and as people walk or drive by, a quick glance is enough to remember your product or name. Branding is important in any business and you want it to be with your business too. People should just see your logo and reconnect with the products and services you have. Don’t underestimate the idea of having the right colors and even a full color image as a background. So having the right contrast and colors is important. If you are a small business owner, then you need a sidewalk sign for two reasons. Number one they are cost effective advertisement and number two they work extremely well. No other form of advertising will give you the results that a sidewalk sign can. Therefore, banners and A Frame signs are your best choices if you are trying to save money. A second advantage of these sidewalk signs is that messages can be interchangeable and can present you with a unique opportunity to reach out with timely messages. These signs are double sided. Make each side different so you can rotate the sign periodically. People that drive by will quickly forget your message if they see the same thing every day. If you’re unsure of colors, choose yellow on black, black on yellow, white on dark blue or white on red. Remember, each face of a sign has two sides. Why not print both sides. Then you’ll have even more sign faces to rotate. Pay attention to county and city sign codes. Although inexpensive you don’t want to have your signs confiscated. Have your sign faces clear coated. Normally, it will more than double the life of the sign face, especially if you select a material such as coroplast.